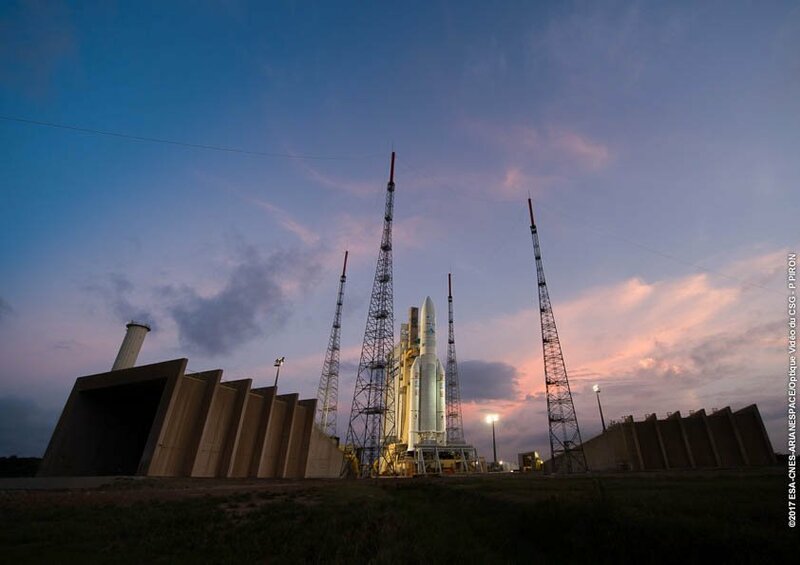 Europe’s Ariane 5 workhorse launcher suffered a very rare on-pad abort on Tuesday when aiming for a sunset liftoff from French Guiana with a particularly heavy pair of communications satellites for operators Intelsat and B-SAT. 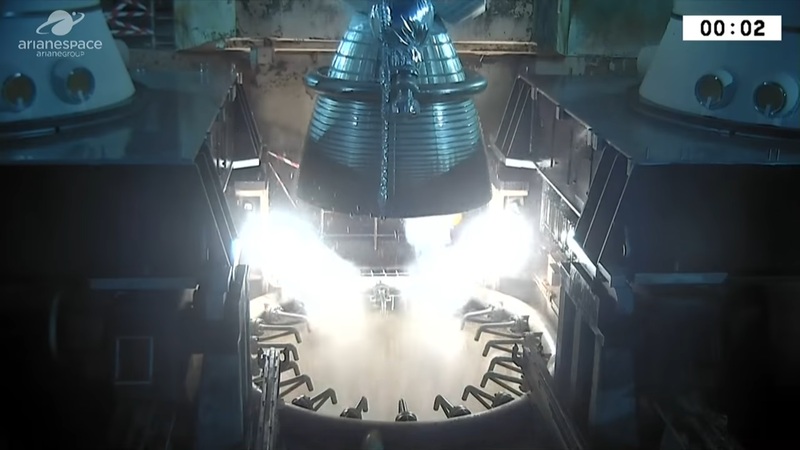 Ignition of the main engine occurred as scheduled, but the launcher’s computers commanded a shutdown of the engine prior to booster ignition due to an anomalous condition. 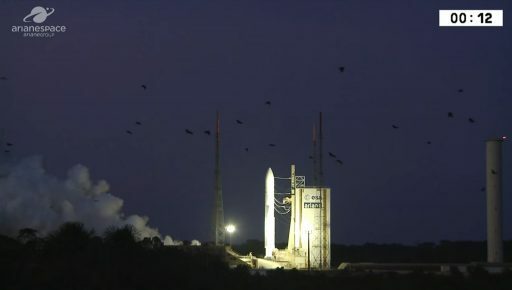 Arianespace said there was no danger to the launch vehicle and its payloads and evaluations into the circumstances of the aborted ignition were underway before determining a new launch date. The launcher will be returned to the Final Assembly Building to undergo re-attachment of umbilicals separated before launch and any repairs necessary to return the vehicle to flight readiness for its second launch attempt. 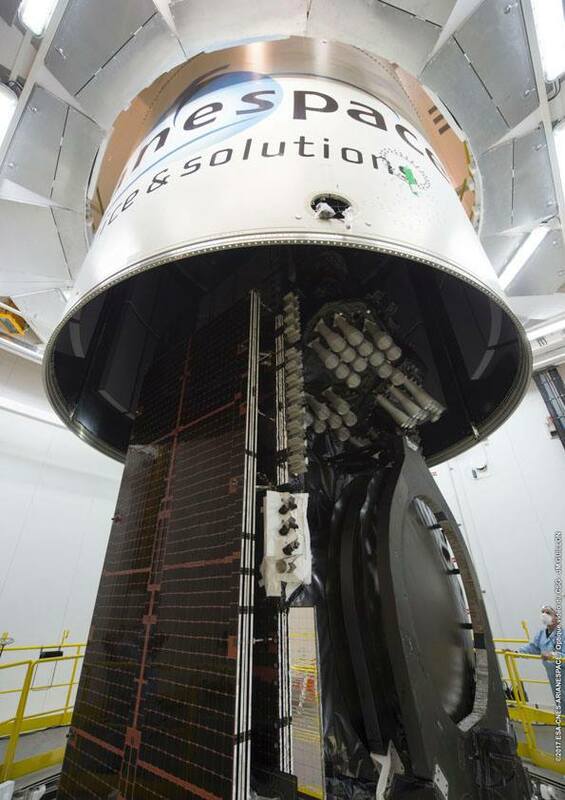 Hidden under Ariane 5 L5100’s payload fairing is Intelsat 37e, riding in the front seat, and BSat-4a, fastened to the rocket’s second stage and hidden under the Sylda adapter that allows Ariane 5 to lift a pair of satellites in a stacked configuration. The two passengers and their adapter systems create a total payload upmass of 10,838 Kilograms, making this the second heaviest Ariane 5 mission to Geostationary Transfer Orbit. Lifting two GEO satellites at once has become Ariane’s bread and butter business and Tuesday’s launch was expected to be no different. 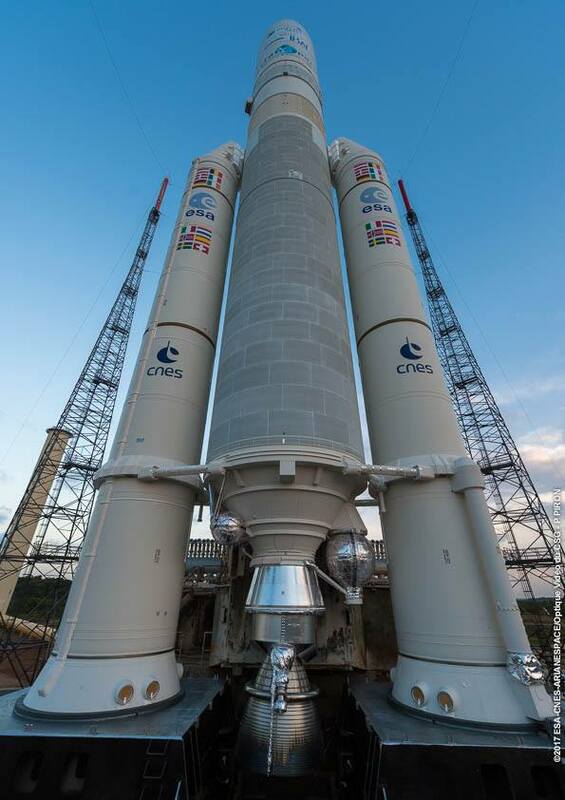 The 55-meter tall rocket was rolled to the ELA-3 launch pad at the Guiana Space Center on Monday and entered countdown operations on Tuesday at 10:28 UTC, gearing up for the opening of a 33-minute launch window at 21:51 UTC, 6:51 p.m. local time or just 15 minutes after sunset and perfectly clear skies expected for the opportunity. 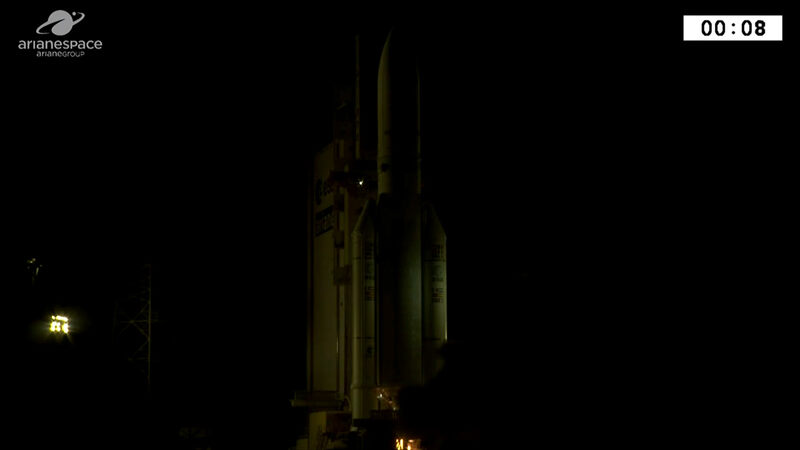 Ariane 5 went into power up operations after 11 UTC and completed an extensive series of tests before heading into propellant loading to receive 184 metric tons of supercold Liquid Oxygen and Liquid Hydrogen. Propellants were kept topped up at flight level throughout the countdown and the colorful sunset provided a fitting backdrop to the launch vehicle as it entered a final computer-controlled countdown sequence at T-7 minutes to transition to an autonomous configuration. No issues arose during the automated countdown sequence and Ariane 5 went through pressurization of its tanks, transitioned to internal power and switched control from ground computers to its own flight computers. The Cryogenic Feed Arms retracted from the second stage at T-5 seconds and the trusted Vulcain 2 main engine fired up when clocks hit zero at 21:51:00 UTC with seven seconds of thrust build-up and engine monitoring planned before ignition of the twin EAP Boosters – the point of no-return. However, the flight computer refused the ignition of the boosters due to an anomalous condition – likely related to the operation of the engine – and commanded the orderly shutdown of the Vulcain 2 engine with flameout occurring around 12 seconds after H-0. The Launch Team immediately went into safing steps to back out of the countdown and put the vehicle on external power and vent down the tanks before diving into data reviews to understand what caused the ignition abort. The most recent post-ignition abort suffered by the Ariane 5 was in 2011 on the VA201 mission which coincidentally also carried an Intelsat spacecraft, Intelsat New Dawn in that case along with Yahsat-1A. VA201 was aborted due to a failed engine gimbal check and was delayed by 23 days to facilitate the rocket’s rollback, inspections, corrective action and rollout. The fastest possible timeline for rollback & re-rollout would be around five days. Due to Ariane 5’s design, a number of irreversible events occur in the final countdown seconds beginning with the retraction of the two cryogenic feed arms for the upper stage. These will have to be reconnected at the Final Assembly Building and the Vulcain 2 engine will require some servicing steps including the replacement of igniter charges. Spacecraft operator Intelsat confirmed the company’s satellite was safe after Tuesday’s abort. The VA239 mission is carrying the 6,438-Kilogram Intelsat 37e satellite in the upper payload slot while the lighter, 3,520kg BSat-4a rides in the lower payload berth for separation 47 minutes after liftoff. The Boeing-built Intelsat 37e will join Intelsat’s satellite fleet as the fifth in the company’s Epic-NG satellite series designed to deliver flexible communications on a global scale through the use of the latest advances in satellite technology. Intelsat 37e hosts a tri-band communications payload with ninety 36-MHz-equivalent transponders in C-Band covering Europe, Africa, the Atlantic, South America and the Eastern U.S./Canada; 275 36-MHz equivalent Ku-Band transponders create 56 fixed Ku-Band beams over Europe, Africa and South America as well as portions of the Eastern U.S. plus a focused Ku-Band beam over Algeria and a steerable Ku-Band beam to direct additional coverage where it is needed; a single Ka-Band spot beam offers high throughput services with a total data throughput of 45Gbit/s across the satellite. BSat-4a hosts 24 Ku-Band transponders for Direct-to-Home broadcasting in standard and high definition as well as 4K Ultra-HD and the advanced 8K resolution. The satellite was commissioned for a 2017 liftoff to provide the maximum margin between its liftoff and the 2020 Tokyo Olympics that are expected to the broadcast by the satellite in 4K and 8K resolution.